This pub was voted one of the best in Shepherd's Bush by Londonist readers. The third BrewDog bar to open in London shares much with its older brethren in Camden and Shoreditch. They all adopt a fairly bare-bones approach to their décor, with exposed brick, iron and wood producing a slightly de-constructed vibe. They all focus relentlessly on (often powerful) craft beer, featuring pretty much the full range produced by their 'enfant terrible' Scottish brewer namesake, as well as a wide selection of similarly interesting/challenging beers from some of the bolder craft brewers on the scene. 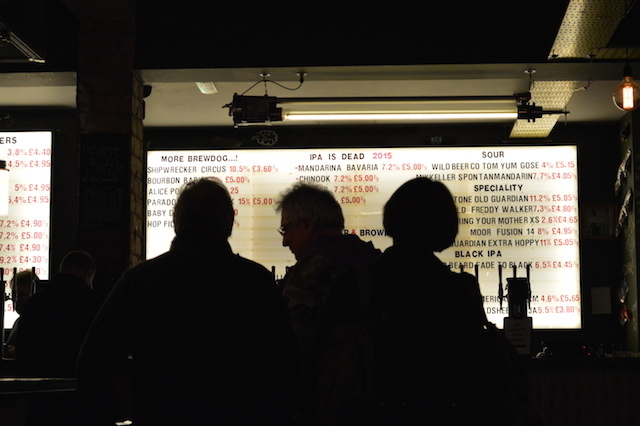 They all eschew cask-conditioned ales in favour of beer served from kegs or bottles, which the usually friendly bar staff will often be happy to guide you through. Those with a gluten intolerance (see our guide) can join the fun with Vagabond pale ale. 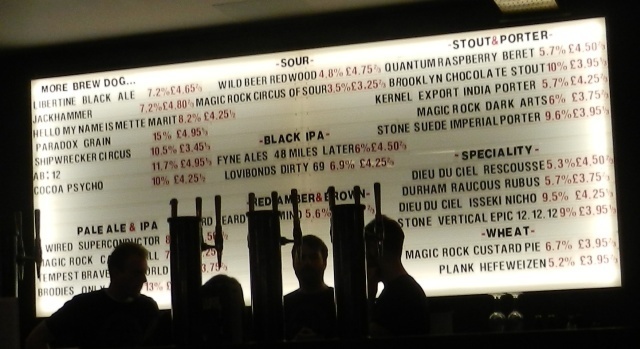 Where the Shepherds Bush BrewDog differs from its London predecessors is scale. It is, simply put, bigger – both in terms of floorspace and the number of beers on tap. The larger premises allow for a slightly more laid-back atmosphere, as well as less challenging toilet facilities, compared with the Camden or Shoreditch BrewDog bars. There's even room for some kitsch knick-knacks, like a Star Wars arcade machine and a couple of pinball options. Food is meat heavy, with brisket cuts, hot dogs and the like helping to soak up all that beer. And check out the periodic table of beer down in the basement. On Facebook. On Twitter as @BrewDogShepBush. On Instagram.